This was on the way to the beach. Isn’t it cute?! Why are miniature versions of things so endearing? Is it because babies — for their survival — *must* be endearing? This nearly looks alive. It is soft and prickly-looking at the same time. 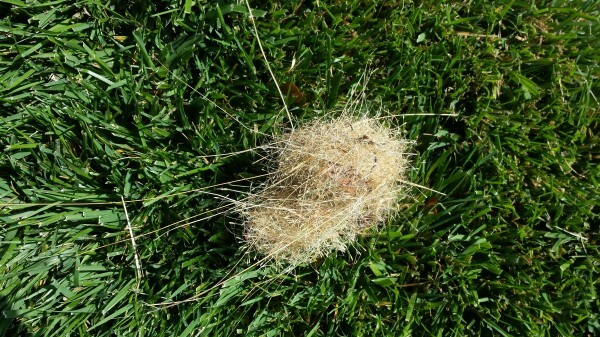 Will it grow into an adult tumbleweed? The other day, there was a large one on the highway and it came sideways into the lower part of my car, making me duck instinctively. I realized that had it come toward my windshield, it could have hung there and obstructed my view — frightening image. Babies — all innocence. Adults — the potential for danger. I’ve eaten baby tumbleweeds, actually, during my high school years in southwest Kansas. We lived in the country, and the little things were everywhere. I was an avid reader of Euell Gibbons back then, and it was from him that I learned just how many things growing in my “back yard” of prairie could be eaten. When young, they’re small and green and tender. Good steamed with a bit of lemon, oil or both.